Rayman Legends has been right at the top of my must own list for a while. It's one of the flagship games built with the Ubiart framework, the engine that has brought us games like Child of Light and Valiant Hearts. 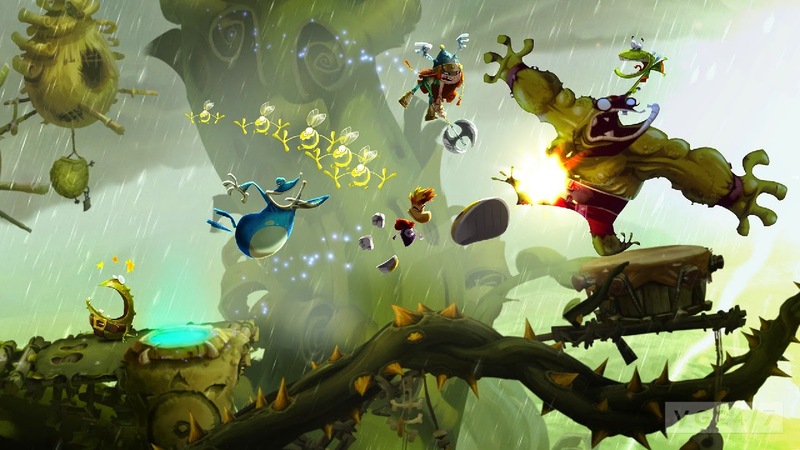 Less heart-wrenching history or poetic fairy-tale, Rayman Legends is a thing of pure joy. It's not enough to say that I enjoy playing this game, I'm enthralled by its charm, humor and design. I'm not going to call this a review. There are so many out there already and I'm so late to the party that I'd only be adding my enthusiastic shouts to the chorus of other journalists and vloggers who've had the presence of mind to buy this game earlier than I. I don't need to try and prove this game's worth to you, it's a generally accepted fact that Ubisoft created something special here. Rayman Legends was originally slated as a WiiU exclusive, a fact made clear by the inclusion of a character named Murfy. Murfy is a fairy-frog thing that can manipulate the environment by moving platforms, hitting switches and tickling monsters. On the WiiU, Murfy is controlled by the gamepad while the PlayStation and XBox versions assign him to a button on the controller, increasing the twitch reflex difficulty of some already intense levels. There is a ludicrous amount of content in Rayman Legends. There are more well over 80 levels, 40 some remastered levels from Rayman Origins, over 30 playable characters, daily challenges, a one on one soccer-esque mode, scratch tickets, a bevy of unlockable content, and some of the best music I've encountered in recent memory. If you're completely unfamiliar with Legends, download the demo and play the "Castle Rock" level to get an idea of what I mean. Everyone in the house plays Legends. Later levels are enough to make an experienced platformer sweat, but the early levels ramp up the difficulty at the perfect pace for younger players. New skills are introduced at key points and featured multiple times in subsequent levels. Timing is arguably the most important skill in platforming titles, and Legends starts to close the window for this jump or that by about the third world; enough time for kids to pick up on the skills but still provide a solid challenge. Rayman Legends is a beautiful thing. I've encountered only a handful of games whose appeal was so universal. There is something there for every age, every demographic. Rayman Legends is free on Xbox Live so there is even less excuse to keep it out of your library. If nothing else, download the demo and see for yourself.